Monitor your fitness on land or in water with the red Gear Fit2 Pro from Samsung. The "Pro" version of the Gear Fit2 adds several updates to the overall design and functionality of the device. Chief among those features is the Gear Fit2 Pro's pool-friendly 5 ATM water-resistance rating that allows it to function in waters down to 164'. Along with its new water-friendly functionality, the Gear Fit2 Pro utilizes an array of built-in sensors, including GPS, accelerometer, and heart rate, to accurately track and display your real-time activity statistics. These stats include your step count, number of calories burned, floors climbed, sleep quality, and more. In addition to daily activity tracking, the Gear Fit2 Pro can also track a variety of sport and fitness activities, including cycling, weight training, and, as mentioned, pool activities. The Gear Fit2 Pro houses a full-color 1.5" Super AMOLED display that lets you see all your activity reports and smart notifications, whether you're standing in the sun or the shade. It incorporates both Bluetooth 4.2 and 802.11b/g/n Wi-Fi technology for pairing with compatible devices, such as your smartphone or wireless headphones. Gear Fit2 Pro also has a built-in, rechargeable battery that has a capacity of 200mAh, so you can expect to get multiple days of use before needing to recharge it. 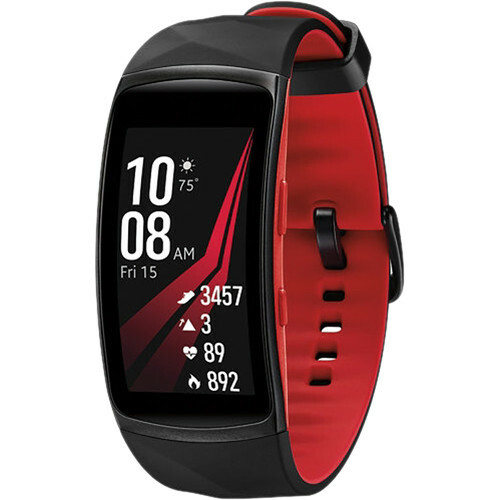 Box Dimensions (LxWxH) 5.2 x 5.15 x 2.5"
Gear Fit2 Pro Fitness Band (Small, Red) is rated 3.7 out of 5 by 11. Rated 4 out of 5 by Anonymous from Amusingly Useful I'm not one to take tracking devices such as these too seriously, but was drawn to the heart-rate monitor (which does not require a chest strap) and sleep tracker. The heart-rate monitor works best if the device is tight against your wrist (otherwise, the results strike me as too low), and the sleep tracker is diverting, though what to do with the results beats me. Otherwise, if you need to know steps/day, flights, a reminder to move or stretch, that's all hear and pairs well with my Samsung phone and Samsung Gear app. It's one flaw is battery life: it gets 48 hours max before having to go back on the charger. Rated 2 out of 5 by Roger from Wristband has design flaw A design flaw in the wristband causes the connector to tear away from the silicon band after nothing more stressful than tightening the band. The band first failed within months of purchase; Samsung repaired it but it then failed again a month later. Samsung now regards this as "user-caused damage" when I've done nothing more than put the watch on my wrist and tighten the band. The watch has poor battery life and suspect tracking of heart rate, but none of that matters when there's no way to keep it on your wrist. Samsung customer service has been a nightmare to deal with (including sending me to a Samsung store to repair the watch only to learn that the store doesn't repair watches). Rated 5 out of 5 by Cassie from Great Product! Everything on this device works flawlessly. Doesn't lag or slow down. All the apps work without glitching. Has so many more options than the Fitbit Charge 2...for the same price. Touch screen is so smooth. Waterproof mode works perfect. The style of the device and band fit very comfortable on my wrist. The only thing negative I have to add is the battery life could be improved. 1.5 days isn't very ideal. But I've learnt to charge it first thing in the morning. Waiting on a new band to make it sleeker looking. Rated 2 out of 5 by Roger from Poor Battery/Design flaw in wrist band Others have noted the extremely poor battery life, but an even more crucial error is a design flaw in the wrist band, which causes it to break over weeks or months from the stress of simply tightening the band. This happened twice, and Samsung refused to replace the second one (and only replaced the first because they had made other mistakes). Customer service is very unresponsive, makes mistakes, requires hours on the phone. Rated 5 out of 5 by Tracker from Great Fitness Tracker Nice tracker that allows me to view and read my texts and email right on the tracker. I couldn't get the heart rate to track enough for my liking on the "frequent" setting so I set it to "always" and that really drops the battery life but I just get used to charging it every night. Overall a great tracker and would recommend to anyone! Rated 4 out of 5 by Anonymous from Great workout tracker! Love this watch! ?Great for workout tracker! ?Love that I can add music to the watch and can change the watch face! Only downfall is the battery. ?Have to charge it every night since I bluetooth it with my phone. Rated 1 out of 5 by Ian from Bad service This supposed waterproof product isn't waterproof. Samsung wouldn't repair it or give a refund. Junk. Rated 5 out of 5 by Junior from Great Product Great product with its full functionality. Comfortable use and visor. What is actually the difference between Size Large and Small? There is a 50mm (about 2 inches )difference.